The Tattoo Archive has very little information on tattooist Youlee, other than the business card shown to the left. Here he is seen at his shop located at 509 East Baltimore Street, Baltimore, Maryland. Youlee also operated a shop at 710 East Baltimore Street. 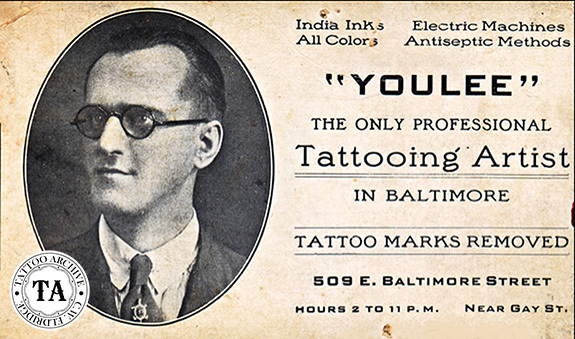 During this era, East Baltimore was the street for tattooing in the Baltimore area. Other tattoo shops were also found at 421, 606, 608 and 722 East Baltimore Street and at 1306 West Baltimore Street. Around 1917 in the early part of his career, Youlee worked with the Polack Carnival as a tattoo artist. Many tattooists of this era worked with circuses and carnivals when they started out. The Polack Brothers operated important railroad carnivals in the 1910s and 1920s. When the depression closed these down, I.J. Polack became the agent for the Milt Holland Indoor Circus that performed only in the winter months. Polack and Louis Stern, took over the same organization and ran it in the summer months as the Eastern States Circus which eventually became the Polack Bros. Circus that played sponsored indoor dates. By the mid 1940s the Polack Bros. Circus had offers of more dates than it could accept and a second unit was formed. Both Polack units continued thru 1957 as major circuses.